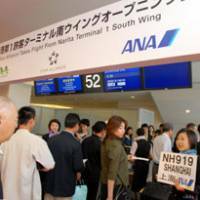 The refurbished South Wing at Narita International Airport’s Terminal 1 opened Friday amid high hopes from the airport’s operator and All Nippon Airways Co., the terminal’s main tenant, that the improvements will attract more passengers. 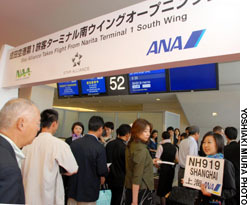 With the completion of the decade-long renovation and expansion, Narita International Airport Corp. (NAA) has arranged the airlines that use the terminal according to their alliance groupings to make connections easier. “(Narita) will be the world’s first airport to allocate each of the three largest airline coalitions (Star Alliance, oneworld and Sky Team) to different terminals,” NAA President Masahiko Kurono said. Initially, 10 Star Alliance carriers, including ANA, United Airlines and Lufthansa, moved to the new wing. Terminal 1’s North Wing will mainly house Sky Team members, including Northwest Airlines and Air France, while Terminal 2 will mainly serve the oneworld alliance, which includes British Airways and American Airlines. Japan Airlines, which uses Terminal 1, plans to join oneworld as early as next year. The reshuffle of the airlines’ terminal locations will be completed by next spring. Kurono said putting carriers of the same alliance in one terminal is easier for passengers who use code-sharing flights. As of September, two-thirds of all code-sharing flights were operated by airlines in different terminals, leading to many lost passengers. With the new terminal arrangement, only 2.5 percent of code-sharing flights will involve moving passengers between terminals, NAA said. ANA is most likely to benefit from the relocation, as it depends heavily on Star Alliance to make up for its limited number of international flights. “We are trying to facilitate connections” for transit passengers by taking advantage of the terminal locations, ANA President Mineo Yamamoto said at a recent news conference. Under the alliance’s “move under one roof” policy, ANA and other Star Alliance members have drastically cut connection times, with transit passengers getting from one international flight to another in 45 minutes, compared with 110 minutes in the past, ANA said. The No. 5 Satellite at Terminal 1 features boarding areas for domestic flights, allowing for easier connections between international and domestic routes. Minimum connection times from domestic flights to international ones have been cut to 60 minutes from 110, and connections from international to domestic flights have been reduced to 75 minutes from 130. ANA has invested some 4 billion yen in the new terminal, including installing 126 automatic check-in machines and new lounges with a total floor space of 6,300 sq. meters. Lagging behind its rival JAL in terms of international routes, ANA hopes the new terminal will boost its international presence. JAL’s decision to join oneworld also prompted ANA to strengthen Star Alliance ties. The airport operator is meanwhile desperate not to fall behind other Asian hubs, according to airline analyst Kazuki Sugiura. Narita, which has one 4,000-meter runway and one 2,180 meters long, ranked eighth in the world in terms of international passenger traffic and second in air-freight volume in 2004, according to the International Civil Aviation Organization. It handled 26.5 million international passengers and 2.31 million tons of freight that year. With the reopening of the South Wing, Terminal 1 has been enlarged to 440,000 sq. meters, 2.4 times as large as it was in 1995. The expansion is expected to ease congestion. It has also installed an “in-line security screening system” — a combination of an explosive detection system and a conveyer system to speed passengers through security. Under the new system, baggage is screened after check-in while on a conveyer belt to the plane, enabling passengers to go straight to check-in counters, eliminating the need for security screening beforehand. Narita is currently at maximum capacity and turning away many airlines seeking slots. To make up for the decline in revenue as a result of the average 21 percent reduction it made to landing fees last October, NAA is seeking other revenue sources to sustain its business. One example is the 3,500 sq.-meter duty-free shopping area in the new South Wing — the largest shopping area of any airport in Japan. Before the 2004 privatization, the airport authority was banned from running stores. But with the ban now lifted, some shops are being run by a company affiliated with the operator, marking Narita’s full-scale entry into the business. Hot on the heels of Narita is Incheon, the world’s 10th largest airport in terms of passenger traffic, at 23.6 million, and third in air-freight volume, handling 2.1 million tons in 2004. “Our strength is that we have huge plots of land available,” Incheon International Airport Corp. President Lee Jae Hee said during an interview earlier this week. Incheon is built on an artificial island with two 3,750-meter runways. By 2020, it will have two additional 4,000-meter runways, with a total area of 4,744 hectares, making it five times Narita’s size. Lee said Incheon hopes to attract 100 million passengers and handle 7 million tons of cargo by 2020. Incheon’s long-term vision is to become an international “air city” complex, where international business and logistics combine with fashion, leisure and entertainment complexes. Analyst Sugiura said Incheon may surpass Narita in a couple of years.